Since the Nikon D5100 was recently announced, I have updated this post to include all the current Nikon dSLR offerings. Read the updated post Nikon D5100 vs D7000 vs D90 vs D3100 here. Just as Canon has made the decision between its consumer and pro-sumer dSLR cameras difficult due to the fact that they all share so many features, now so has Nikon with the release of the extremely admired new Nikon D7000. Although the D7000 sits above the Nikon D5100 and between the Nikon D90 and the Nikon D300s in price and features, its impressive new sensor, increase in megapixels and resolution, improved autofocus (AF) system, and construction and controls have made it a viable upgrade not only to the D90, but it some aspects it even challenges the more expensive, semi-professional D300s. Have its impressive specs created a lame duck of the D300s? As I always like to point out, when you are trying to determine which camera to purchase or upgrade to, you need to first consider and determine your needs, and then see which camera fills those needs. Not the other way around where you look at the new features and speculate if you really need or will use them. The latest cameras almost always have more impressive features and specifications than the preceding models, but if your needs and shooting style don’t required those upgrades then it is possible that you can save some money and be completely happy with a less expensive or earlier model. Sensor and Image Quality: The sensor of the D7000 is greatly improved over both the D90 and the D300s in a couple of ways. The D7000 has 16.2 megapixels, where the D90 and D300s each have 12.3 megapixels. This increase in resolution allows for more intrusive editing of the files in Photoshop, the ability to crop a picture and still obtain an image with high enough resolution for printing or display, and allows for larger prints. In addition, the improved sensor, manufactured by Sony, results in better performance at high ISO settings and in low light, better dynamic range, tonal range, and color sensitivity. Have a look at dxomark.com to compare the sensors – run your mouse along the red-to-green color bar to the right of the graphs to see how these differences affect images. Exposure Metering: The 2016 pixel RGB metering sensor of the D7000 is also improved compared to the D90 and D300s, and will result in better TTL metering performance of straightforward and complex lighting scenes and situations. All three cameras offer matrix metering, center-weighted, and spot metering. With center-weighted metering, the D90 can make use of your choice of a 6, 8, or 10mm center circle for its weighting, while the D7000 and D300s add a 13mm circle option to that. Autofocus: The autofocus system of the D90 has 11 autofocus (AF) points with the center one being the more accurate cross type. The D7000 boasts a significantly improved AF system of 39 AF points with 9 of them being cross type. The D300s offers 51 AF points with 15 being cross type. The AF systems of the D7000 and D300s allow for you to use these points in various ways including automatic AF point selection, single point AF, and dynamic area AF using your choice of 9 points, 21 points, all points, or all points with 3D-tracking. With the D7000 you can also use a custom function to limit the AF system to 11 points, which may be more manageable for someone who wishes to manually select their AF points. Body, Construction and Size/ Weight: The D90 and D7000 appear very similar at first glance, but the plastic body of the D90 has been upgraded to the partially magnesium alloy body (top and rear) of the D7000. This adds slightly to the weight: 1.5 lbs for the D90 vs. 1.7 lbs for the D7000. The D300s is slightly larger than the other 2 bodies, and weighs in at 2.2 lbs, with full magnesium construction. The sturdier construction of the D7000 vs. the D90, including its nicer rubber gripping surfaces, creates the impression and feel of a more professional body. The D7000 and D300s have weather sealing at the memory card and battery doors. All 3 cameras have a 3″ rear LCD screen as well as a top LCD panel. It is worth noting that the magnesium alloy body of the D7000 does not fully extend around the front, and thus the area surrounding the lens mount, which plays an important role in supporting a heavy lens, is plastic. See this image of a D7000 skeleton next to one of a 7D for details. ISO: As mentioned in the Sensor/IQ section above, the high ISO performance of the D7000 is greatly improved over both the D90 and the D300s. The tests at dxomark.com tell this story, along with the fact that the native ISO range of the D7000 is 100-6400 expandable up to 25,600. The other two cameras have a native ISO range of 200-3200 expandable to 6400. This means that with the D7000 you can use higher ISO settings when required, such as in low light situations, and not have as much difficulty with digital noise, particularly in the shadow areas of images. Early reports indicate that the high ISO performance is excellent. Controls: The controls of the D7000 are similar to the D90 with some changes including the addition of the shooting mode ring under the mode dial (to change from single shot to high speed continuous to self timer, etc. ), and the live-view switch with movie record button inside it. The top AF button of the D90 is incorporated into the AF switch and button at the base of the lens on the D7000. The D300s has entirely different switches, dials, and buttons than the other two cameras, however this allows for quicker and easier access to more features on the D300s since the D300s has more controls and settings directly available on the body. The D7000 also offers more white balance options than the other two cameras, plus 2 customizable user settings (U1, U2) on the mode dial, and you can assign functions of your choice to buttons such as the Fn Button. Wireless Flash: All three cameras allow for advanced wireless lighting using the built in flash with Nikon Speedlights. Brief commercial interruption: I would like to mention that I have written an eBook user’s guide for the Nikon D7000. After spending so much time studying, experimenting, writing about, comparing, and discussing the camera, I decided to put some that knowledge into eBook form! The guide covers all the Shooting, Setup, and Playback Menu settings and Custom Setting options – with recommended settings – plus discussions of how, when, and why to use the cameras’ settings and features, (metering modes, aperture and shutter priority modes, advanced autofocus use, focus lock, exposure lock, and more) for everyday and travel use, to help you take better photos. Click HERE to learn more about it – Nikon D7000 Experience – and to view a preview, or purchase it! Viewfinder: The D90 has a viewfinder with 96% coverage of the actual resulting image, while the D7000 and D300s have improved large, bright 100% viewfinder coverage. Processor: The D90 and D300s have the Nikon Expeed Processor, while the D7000 has the improved Expeed II processor. This allows for more video options including full 1080p HD at 24fps, and overall faster processing of stills and video files. Continuous Shooting Speed: The D90 can shoot 4.5 frames per second (fps) up to 100 images, the D7000 shoots 6 fps up to 100 shots, and the D300s shoots 7 fps – or 8fps with the battery grip. If you often capture action and really need the higher frame rate, such as for sports or wildlife shooting, you are going to have to seriously consider the D300s over the D7000. Otherwise, 7 or 8 fps is often complete overkill in typical real-life use. Memory Card: The D90 uses a single SD memory card. The D7000 accepts 2 SD cards, where the second card can be used in a variety of ways: overflow, JPEG on one / RAW on the other, or mirrored backup of the first card. The D300s uses 1 CF card and 1 SD card, which also can be configured in a variety of ways. The second card can come in handy as well if one is shooting a lot of video files. Battery: The D7000 uses the new, higher capacity EN-EL15 battery, which will last for over 1000 shots, and accepts the optional MB-D11 battery pack/ vertical grip which is constructed of magnesium alloy. The D300s uses the EN-EL3e battery and the optional MB-D10 battery pack/ vertical grip. The D90 also uses the EN-EL3e battery and its optional battery pack/ vertical grip is the MB-D80. Full HD video: The D90 and D300s offer 720p video at 24 fps, with a 5 minute shooting time. The D7000 improves this tremendously with full 1080p HD video at 24 fps for up to 20 minutes with full-time continuous autofocus. Plus it offers 720p at 30, 24, and 25 fps. Shooting Experience: The D7000 feels and performs great. After spending some time with the D7000, and getting over all its quirky differences vs. Canons – as far as menus, custom functions, and buttons/ controls – I’m really beginning to become attached to it. I actually prefer some of the controls it provides vs. the Canons plus some of the options it provides, such as the optional grid in the viewfinder, the ability to limit the AF points to 11 including the 9 cross type points – for quicker manual selection, the ability to change the continuous low shooting speed between 1 to 5 shots (I complained over a year ago that the 7D should have had that feature as its 8 fps is usually overkill for me), and the versatility to change the size of the central spot size for center weighted metering. Also, thank goodness the D7000 includes the ability to reverse the + and – directions of exposure compensation, because the Nikon default is just plain wrong! So as you can see, the D7000 truly is an improvement over the D90 in every way, and an improvement over the D300s in many ways. Unless you have a couple very specific needs that only the D300s can accommodate – such as faster continuous shooting speeds, direct access to certain controls and settings, and a full magnesium alloy body – then it may be difficult to justify the older D300s over the new D7000. 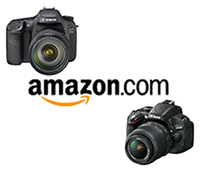 Purchasing these cameras: If you plan to buy any of these cameras, accessories, or anything else through Amazon.com or Amazon.com UK, I would appreciate it if you use my referral links. Your price will be the same, and they will give me a little something for referring you, which will help support my blog. Thanks! In the USA, use the links throughout this post or use this referral link to Amazon. And for those of you across the pond, click here for my referral link to Amazon UK. If you are in another country, click on one of my Amazon links, scroll to the bottom of the page, and click on your country for your local Amazon. Thank you for supporting my efforts! Purchasing from the UK? Use my Amazon UK referral link here. If you are in another country, click on an Amazon link, scroll to the bottom of the page, and click on your country for your local Amazon. If you wish to purchase from B+H Photo please click the link below. Thanks! Accessories and Books: Now that you are on your way to deciding on a camera, you should also start looking into photography gear, accessories, and books. Check out these links, dSLR Photography Gear, Accessories, and Books, which discusses essential gear plus accessories specific to Nikon cameras; Equipment for Travel Photography, which discusses useful and practical photo accessories and equipment for both everyday and travel photography. DPReview has excellent, very thorough reviews of all of these cameras, including one just published for the D7000. The D7000? Yes, it just may have earned that spot! Thanks a lot for all of your review and comparisons. But there was something still bothering me about battery grip for d7000. all of the battery grip for d7000 contain only one battery in the grip and one in camera. A bit hard when charging the in camera battery since need to open the grip time to time. Unlike the dual batteries slot in d90 grip. much easier than d7000 one.